Ministry of Health organized the Nirogee Lanka Health programme from 1st of December 2014 to 7th December 2014. Main programme for school children was held on 1st of December 2014 at Ananda College, Colombo. On that day office of DDG (Dental Services) carried out special brushing drill activity for school children at the primary section to give them the knowledge and practice of proper brushing techniques. Office of DDG (Dental Services) handed over the 72 new government appointments for the dental surgeons on 14.11.2014 at Main Auditorium, Ministry of Health. Minister of Health was the chief guest of that programme. Sri Lanka Dental association and Unilever Sri Lanka. An arts and crafts exhibition, a health walk and an award ceremony were held as activities during the day’s morning. The award ceremony at the Viharamaha Devi Open Air Theater applauded the winners of the arts and crafts competition and were given certificates and valuable gifts. on good oral health practices. The demonstration of hand-piece maintenance was held at the Dental Clinic of Provincial General Hospital Rathnapura on 17th of march 2014. This training is expected to reduce the breakdowns in these equipment. Minister of Health Hon. Maithripala Sirisena presided the function held at the National Blood Transfusion Service, auditorium to handover the appointment letters to 89 new Dental Surgeons recruited to the Government Service. 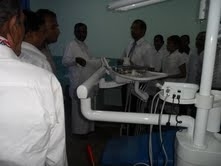 was held over three days at the Institute of Oral Health, Maharagama. The inauguration was graced by Dr. Sujatha Senarathna the former Additional Secretary, Ministry Health. the Fisheries and Aquatic Resources Development Minister Hon. Dr. Rajitha Senaratne. Opening Ceremony on 24th January 2013. 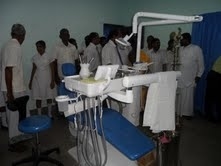 Photos and videos related to Dental Services in Sri Lanka can be showcased on this page. If you have something worthwhile sharing with the world, Please email them to admin@dental.health.gov.lk for inclusion.